Finally, a tool and technique that will give you high success adding fabric corners to basic shapes. For years we’ve been layering small squares on big squares, marking & stitching on a diagonal line, then hoping everything lines up when we fold the small corner section back into place. If you’ve tried it, you know the pitfalls: too big, too short, too crooked and way too wasteful. No more. 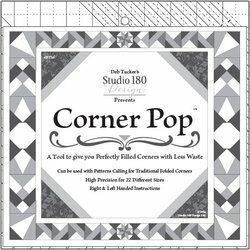 With your new Corner Pop™ tool, you will be able to trim rather than mark, add an oversized replacement triangle and then square everything to a perfect size. In 22 different sizes - whole, half and quarter inches. Increased success without undue stress for every level of quilter. What’s not to love!